Are you graduating soon and feeling terrified? 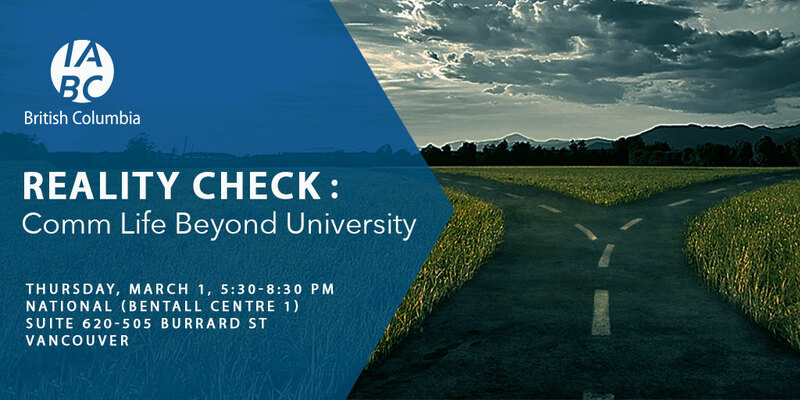 Are you beginning your post-secondary studies and unsure of your career goals? Are you considering a job or education in the field of communication? If you said yes to any of those questions, we’ve all been there. We’re always thinking of ways to help you not only discover your passion and what makes you unique but also to provide you with insight and knowledge that you might not be getting in school. That’s why we invite you to attend the workshop Reality Check: Comm Life Beyond University on March 1, from 5:30 p.m. to 8:30 p.m., at NATIONAL, the public relations firm. As influential as our instructors are (and as engaging as lectures and course content can be), there are certain aspects of our future careers that we simply can’t learn in the classroom. Rather, we have to get out and experience them ourselves. So come meet our fabulous guest speakers — professionals from a variety of areas and seniority levels in communications. You’ll hear great insights, and have 60 minutes of Q&As to learn from them. Whether you’re a seasoned networker or a first-timer, don’t sweat it. We create a comfortable space for discussions about topics that matter to you. In this workshop, we’ll cover topics such as challenges as a new hire, the importance of work ethics and how to live a balanced life. Maximize your learnings at this workshop. Join us and kick-start your career with our support. Learn more and register here.